Blogging isn’t dead – it’s even bigger and better than ever. If you don’t have a blog, you should: it lets you generate trust and authority, build an email list, and make some money with affiliate marketing. 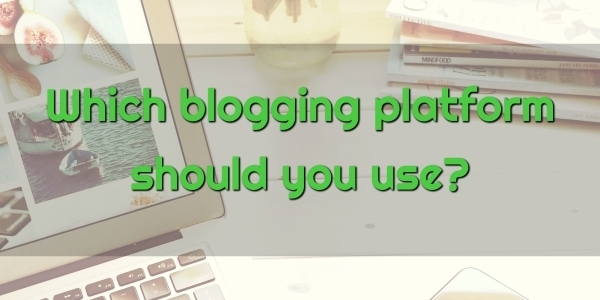 But which blogging platform should you use? There are a whole bunch of options, though there only one or two I would really recommend (I’m biased – very, very biased). Let’s go through them. But first, there are two very different types of blogging platforms: fully hosted and self-hosted. Fully hosted blog platforms are where some company hosts your blog for you. You don’t have to get hosting, install WordPress, or anything like that. They take care of all the technical stuff. You just start producing content. Depending on what plan and platform, it might even be free. That might sound great, but there are some serious shortcomings. I’ll discuss those when we get to the self-hosted options. A self-hosted blogging platform is a software that you install on your own web host. So you get your domain name, get your hosting, link them up, then install the blogging platform on your host. Then you can do whatever the hell you like with it! It’s your hosting package so you have full control over the server and filesystem. You can go in and delete all the PHP files and break your site completely if you feel like it (though I don’t recommend you do so). You don’t have to follow anyone’s rules, you don’t have to put ads on your site, you can use any domain you like, you can install anything you want. This is truly your own turf and you are the king. I don’t like playing by other people’s rules so this is perfect for me! WordPress.org is the big daddy of blogging platforms. It’s been around for a long time and powers roughly 58% of all websites on the whole damn internet. Which is insane. WordPress started in 2003 as a fork of some very old platform called B2. It is built on an old programming language called PHP, and uses the MySQL database system. It is open-source and free and can be installed on pretty much any web host in the world. A great advantage of WordPress is that it is quite easy to use. Maybe not as much as the fully hosted platforms, but it’s pretty simple. Most hosts have a CPanel that supports One-Click Install of WordPress. That means you don’t have to muck around with running scripts or moving PHP files around your host’s filesystem. You just click a button in CPanel, put in some details, and watch as it gets installed in about a minute. Another great advantage is that it has an enormous community of third party tools, themes and frameworks to work with. If you want something really simple, you can just install it, pick the default theme, and start writing. But if you want to make your site something special, you can really extend it to do just about anything. If you’re wondering, this website is built on WordPress.org, with a theme and lead-generation plugins from a premium paid WordPress pluging collection called Thrive Themes (which is pretty amazing). There aren’t a lot of disadvantages to WordPress. One is that it is not super secure. People find holes every now and then. But the people behind WordPress keep it patched pretty regularly, so if you make sure to update every time a new version comes out, you should be ok. I’ve never had a problem with security. There are also plugins that help with security, like Wordfence. Another one is performance. The default settings in WordPress aren’t necessarily the best in terms of website caching and performance. The dreaded Google Page Speed Test probably won’t give you a great score, and it could get worse after you install more plugins, add a bunch of images that aren’t properly optimized, and so on. Fortunately, there are plugins (are you seeing a pattern?) that can help with this – and some simple best practices can go a long way. If you are still struggling, there are people on Fiverr or Upwork who can set things up properly for you. WordPress.org is an amazing free piece of software and I cannot recommend it highly enough. If you are thinking of starting a blog, and I think you should, and you want to go self-hosted, and I think you should, I recommend to choose WordPress. There isn’t much else to choose from as far as self-hosted blogging platforms go. Well, as far as personal or entrepreneur blogs go. There are two other big platforms worth mentioning: Drupal and Joomla. These are similar to WordPress in that they are open-source self-hosted blogging platforms, and they also are built on PHP and use a MySQL database. There are also much less popular than WordPress.org, and are aimed at a different market. Drupal and Joomla are more advanced platforms that target larger companies, universities and other organizations. They have a lot more options in terms of setting up multiple users and role-based permissions (WordPress.org does this but not very well). They are more complex to setup and configure, and plugins and extensions are harder to install (you might need a developer or too). If you’re a personal blogger or entrepreneur, you could definitely choose Drupal or Joomla (most hosts will offer easy install through CPanel). But unless you have a company of 10 or more people, I can’t really see why you would want to. I personally think you really should get a domain name, get some web hosting (probably from BlueHost or SiteGround), and install WordPress. As in, wordpress.org – to go the self-hosted blog platform route. But maybe you don’t to. Maybe that is beyond your technical skills (it’s actually not that hard, I have a free guide on how to start your own blog if you’re a bit freaked out by the idea), or you don’t have the energy or budget to make all that happen. Well, you can choose from many fully hosted blogging platforms. For these, you don’t need to get a domain or hosting or install anything. No mucking around in CPanel. So these are easier to get started with, but they have some shortcomings. All these options are very limited in what you can do with your blog (extremely limited in some of the cases). You can’t install plugins, you can’t get your hands dirty and mess around with the underlying code. And you’re playing in someone else’s sandbox. They will take care of security and platform/infrastructure upgrades, which is nice. But you’re hoping their platform works and performs and stays popular. Let’s go through some of the options. Note that there are many more than this, dozens if not hundreds. But if I haven’t listed them here, they’re either a minor player (so you probably shouldn’t be trusting your content with them at all), or they are kind of popular but they just don’t have a good offering (like Blogspot). Haven’t we already done WordPress? Well this is the other version – wordpress.com instead of wordpress.org (I explained more about the difference in this article). This is WordPress hosted by a company and they will let you put your blog up there. You can get a very basic plan for free, but you can’t have your own domain name (it will just be a subdomain, i.e. something.wordpress.com), you can’t install plugins, you can’t edit your CSS (Cascading Style Sheets), and it will have WordPress ads on it. This is pretty poor – but what do you expect for free? You’re definitely not making money off this blog – WordPress.com is making money off of you! You could put affiliate links everywhere, but is anyone going to take a website seriously that doesn’t even have a domain name? I don’t think so. The good news is you can upgrade to some pretty affordable and decent tiers. There’s a Personal one for $5 a month that lets you have your own domain name (yay) and gets rid of the WordPress ads (yay). You can also go up to a Premium plan for $10 that has more themes, lets you edit the CSS yourself (it’s a bit scary but a bit fun – go on, what’s the worst that could go wrong? Only your whole site disappears, not so bad). And you can put your own ads on your site (though this is a poor way to monetize a site unless it is getting a hell of a lot of visitors). Or a Business plan for $33 that lets you install plugins (though I don’t think you have quite the choice that a wordpress.org hosted option has). I like and trust WordPress, and I think the $5 or $10 options are a pretty good deal for someone who doesn’t want to go the self-hosted way. And you could later upgrade to the Business tier for some serious power (though by the time you’re paying that much, you might as well just get hosting yourself, it won’t cost anywhere near that much). There are a couple of online website builders that have pretty similar offerings – Wix and Weebly. They’ve both been around for about 10 years and have quite a lot of customers. They offer drag-and-drop website or blog building, and they do all the hosting, upgrades, security and everything. They both have a free plan with ads (their ads, not yours), and several levels of paid tiers where you don’t have ads. Although the cheapest Wix tier, $7, still has ads, which is a bit poor – a $5 WordPress.com plan doesn’t have ads. Just saying. These platforms could be good if you are a real beginner and want something very easy to build a simple site with. But you will be very limited in what you can do with it, and are at the mercy of these companies – they might change their policies, prices, or templates at any time. I would probably go with WordPress.com over one of these offerings, especially because it’s also a cheaper offering (and the learning curve will be a lot nicer if you do what I recommend and move to a self-hosted wordpress.org plan). Now, this is an interesting blogging platform. In some ways it is actually more like a social network – people create Medium accounts, follow each other, and scroll through a news feed and click through to things they find interesting. But the content is articles and blog posts, not social media posts. I’ve been on Medium for a while and know a fair bit about it (but I haven’t specialised in it and I’m not a guru by any stretch). The main thing I use it for is cross-posting – I have a WordPress plugin that automatically creates a Medium post when I publish a blog post, including inserting images, formatting headings, and so on. Which is neat. There are two advantages of Medium. First, it is really (and I mean REALLY) quick and easy to get started on it. Even more so than Wix or whatever. You can literally create an account and start writing in about 20 seconds. You just create an account, start typing, and hit Publish. Anyone can do this. If you want to test out some ideas or explore a niche to see what sort of engagement you can get, this could be a good option. Another advantage is that it comes with an audience built-in. People go to the Medium website or phone app and go scrolling through content to try and find things to read. If you’re lucky, Medium might show your article to them. So you can basically get free views, especially if you write good articles, follow people in your niche, and put the right tags on your content. Don’t expect more than a tiny of handful of views per day at the start – though this will probably be more than a self-hosted blog in the early days (which will be zero for a while, as you won’t be ranking in Google and you don’t have that built-in audience that Medium does). However, this audience does not scale up as well as an audience on Pinterest or Instagram or something does. I have published about 200 articles over three years on Medium, I have over 2500 followers, and I am still only getting about 40 views a day. If I had put that effort into Pinterest or Instagram, I would be getting 10 or 100 times those results. So Medium has some pros and cons too. It’s also possible to really go down the rabbit hole and study the algorithm, reach out to influencers, and boost your results. Any content in the personal development, motivation and psychology niches tends to go really well here (other niches struggle a bit). Anyway, that’s my overview of blogging platforms. As I’m sure you’ve picked up by now, I’m a major WordPress fan and recommend you make your own self-hosted blog. So that’s my top pick. But if you’re going to go with a fully hosted solution, I would recommend WordPress.com, since it has some good well-priced options and a better offering than other platforms out there. If you disagree or have more questions, please leave a comment below!